I have not done a real haul in awhile and it's felt like months.... Although Project 10 Pan is in effect, I am making a few exceptions due to the good weekly deals at drugstores the bunch of coupons stacking up on my desk. 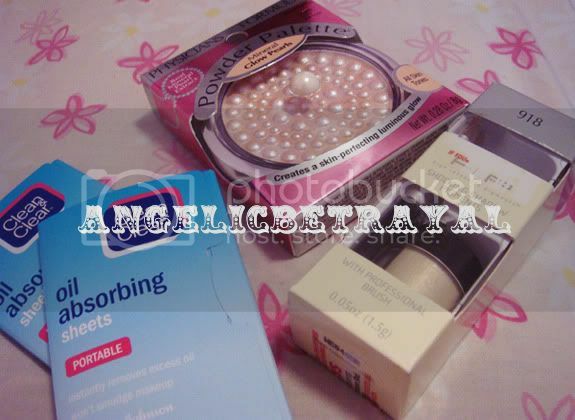 I headed to CVS and Rite Aid to scour the beauty aisles for some necessities and items I've been wanting to try. From CVS I picked up a Physician's Formula highlighter because they were offering $7 extrabucks if you spent over $10 in Physician's Formula. I really like highlighters because they brighten up the complexion and I do like Physician's Formula as a drugstore brand because they come up with high quality items with interesting packaging and presentation. I desperately needed oil blotting sheets even though I've gone without them for many months.... I've only bought the $1 E.L.F blotting sheets which I did not like very much. All my friends love the Clean and Clear sheets and it was buy one get one 50% off so I decided to snag two packs. I really like the texture of these sheets and the way the papers are caught by the sticky tab which makes them easier to pick up. An issue I faced with the E.L.F ones was that it was hard to get only one of the thin sheets with my fingers. Some L'oreal products were on clearance for 75% off so I snagged up a pigment in Restless since it has been compared to Mac's pigment in Vanilla. I can't wait to try these products :) I have high hopes for these! 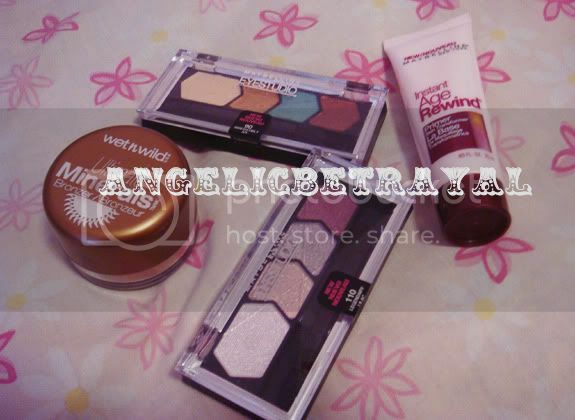 Rite Aid was running 40% off both Maybelline and Wet n' Wild, so of course I had to pick up some goodies! I've been wanting to try a face primer for awhile and I heard some decent reviews about Maybelline's Age Rewing Primer so I went ahead and got it. The tube is quite small but I do not use the primer on my whole face. I've used this once already but I want to use it a bit more before I can review it. I also picked up two more of the Eyestudio quads in Irrestibly Ivy and Legendary Lilac. I already have Copper Chic and Taupe Temptress in my collection which I purchased back in March. I might be picking up more of these quads in the future. I have my eye on Give Me Gold and Green With Envy. There are 12 quads in this collection but I do not think I will be getting the entire collection. I recently heard that Wet n Wild's Mineral Bronzer in Amber Glow was a dupe for the Mac's highly coveted mineralize skinfinish in Stereo Rose so I thought it was a good product to pick up. I really like the generous amount of product in the jar and I can see the color being something I'd love to wear in the summer when my skin is tan. These products were all purchased throughout this week and all the sales are still running so go out and check out your drugstores if you're interested! In total I spent about $30 including tax after all the discounts and coupons. At retail price, these would have cost more than $70 before tax! So I feel like breaking the ban to do a little drugstore hauling was justified since I saved so much money :) I will be reviewing these products separately in upcoming posts!